There has been opposition to tree felling work in Sheffield. The Government's tree champion Sir William Worsley has called for stronger protections for England's street trees in the wake of controversial felling work in Sheffield. Sir William, who was appointed earlier this year by Environment Secretary Michael Gove - a vocal opponent of Sheffield Council's tree removal work, is launching an 'Urban Tree Manual' which contains advice for local councils on community consultation in a bid to stop what Defra terms 'unnecessary felling'. The removal of thousands of street trees in Sheffield and their replacement with saplings as part of a highways maintenance contract was put on hold in March following a national outcry at the use of dozens of police officers and private security in supporting the operations after growing protests. 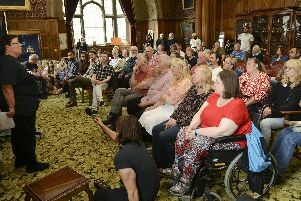 Talks are currently taking place between Sheffield Council, contractor Amey and tree campaigners, while the Forestry Commission is investigating whether the programme of work has been carried out illegally. One of the main aims of the new tree manual is to ensure residents are properly consulted before street trees are felled. It brings together knowledge from organisations include the Forestry Commission, Forest Research and the Animal and Plant Health Agency and includes advice on choosing planting locations that maximise environmental benefits. Sir William, who is chairman of the National Forest Company and lives in North Yorkshire, said: “Whether they’re rooted in countryside woodland or in urban cityscapes, trees make our environment more attractive and a healthier place to live and work – which is why expertise in the planting and maintenance of urban trees is vital. Sir William added: “It’s clear to me just how passionately people feel about trees. And perhaps nowhere is this more evident than in Sheffield, where the strength of feeling from local residents about their cherished green spaces has been unprecedented in scale. “These residents have not only raised concerns about the sheer number of trees being felled locally, but importantly in the way this has been carried out – without proper consultation and without taking into account their concerns. “This has led to an investigation by the Forestry Commission, which is still ongoing. I will be letting that run its course and considering the findings carefully. The release of the Urban Tree Manual forms part of the government’s wider work to protect and promote our precious trees, including our commitment to plant one million trees in our towns and cities and eleven million trees nationwide over the course of this parliament. Protecting and planting more trees is a key part of the Government’s 25-Year Environment Plan, which aims to leave the country’s environment in a better state for the next generation.